I have been battling acne lately as a result of stress, pregnancy, and food cravings which are totally random lately and not always very healthy! As a result I’ve been switching my skincare routine around a little bit and I wanted to share some products that I’ve noticed are making a difference for me. This is a bit of a gloss over but some of these products will pop up later in a more in depth review if they’re something really special! For cleanser, I rotate depending on my mood. I’ve used Alba Botanica’s Natural Acne Dote Deep Pore Wash a lot with my Clarisonic. It’s unscented and pretty mild, so doesn’t irritate my skin at all. The price is right with this too, since you can find it for under $10 wherever it’s carried! By the same company, Natural Acne Dote Clean ‘n Treat Towelettes are super nice for a quick wipe down of your face. I like to refresh with these on my no makeup days. I don’t use facial wipes on a regular basis, but I like to have them on hand when I’m at the gym, and I use them in the morning if I don’t want to wash my face. Niora Alpha Clear Cleanser is a new product line to me, and is specifically formulated for anti-aging and adult acne. What I appreciate about this is that it’s great for adults unlike a lot of acne products out there. It targets lots of my needs at once in fact- fading fine lines/wrinkles, balancing oil/dryness levels, cleans, moisturizes, shrinks pores, and fades age spots. It’s a creamy cleanser and doesn’t lather- it’s more like a lotion in consistency really, but you can tell it’s cleansing the skin. I like that my skin feels soft after using this and not stripped of oils. None of these cleansers are going to remove your makeup though- so you’ll want to begin your regimen with a good eye makeup remover and something to break down the rest of your makeup, like a cleansing oil. I’m really picky about what toner I will use, but it’s a step I never ever skip in my skincare routine. If I don’t use a toner my skin feels beyond icky. If I am exfoliating with a scrub like in my next step, I will skip this step but every single other time I wash my face, this is the next step. I’ve tried organic toners, mild toners, witch hazel, etc but I keep coming back to my trusty Clinique Clarifying Lotion 2. I’ve tried the acne toner and it strips my skin, and I’ve bumped it up to the number 3 toner for oilier skin to see if that will do, and that strips my skin too. I really enjoy the number 2 toner because it keeps my moisture levels of my skin in check and when my skin gets too dry it really aggravates my acne worse. This stuff is the bomb and I’ve never found anything I like as much. If I had to choose a runner up it would be Niora Naturals Firming Toner. I really like this toner because for a couple reasons. First, it’s from that same line that targets acne and anti-aging at the same time, so you’re going to get a lot of skincare benefits from using it. It doesn’t dry my skin out but I can still feel that it’s getting in there are getting some of the gunk out of my pores. My skin feels softer and more hydrated after using this, but also cleaner, which is a rare quality to find in a toner. It’s also in a spray bottle so it’s super convenient! Exfoliating is not a step I do every day but every other or every third day I like to use a scrub formulated for acne. I think it really helps to smooth my skin and release the gunk in my pores. I don’t have big, poppable pimples hardly ever. What I am plagued with is what looks like perfect skin from afar, but when you get super close you can see the little whiteheads that are burrowed deep beneath the skin. They are very hard to get at and the best way I’ve found for tackling them head on is with a good exfoliator. Micro Magic by Bliss is super gentle but also powerful. It uses fine volcanic pumice in a cream-based treatment. The texture is so extremely fine that I can’t even think of anything to compare it to. A little goes a long way, and after using it for one minute it gets a little bit tingly with a slight cooling sensation. I always take special care to make sure I have this completely off my face when I am using it, because the product is literally so fine, it sometimes feels like I got it all off then when I go to put makeup on, I realize I didn’t get it all off after all. My skin feels incredible and so smooth after using this product. My other favorite exfoliator is ExfoliKate Acne by Kate Somerville. This is truly magic in a tube. With my first pregnancy, I was broken out so bad, and I remember trying a sample of the regular non-acne ExfoliKate and I nearly cried in the shower because I could finally feel something working on my skin. No matter what I did to my skin, I wasn’t able to get my acne to go away. At the time, I didn’t realize there was an acne formulation of the product. This stuff is even better at nixing acne because it’s actually formulated to do so. It has antibacterial, anti-inflammatory, and antioxidant ingredients to not only fight the acne you have, but to prevent new pimples from forming. It doesn’t dry the skin out, and you can see a difference immediately in your skin. I won’t go further into an explanation on this quite yet because I plan on doing a more in depth review of the Kate Somerville acne line and I’ll fill you in then! After washing and toning or exfoliating, my next step is always a spot treatment. I need something to put on those stubborn little buggers that just won’t go away. I don’t apply these to the whole face, but if I have a breakout that is where I put the treatment. Clinique Acne Solutions Clinical Clearing Gel is the stuff I’ve been using the longest. My husband and I each have a tube of this and we’ve been going strong for at least a couple years on each tube. In fact, I’m probably ready for a new one because mine is old enough that the ingredients probably aren’t even working anymore. This is the gold standard for acne treatments for me and it’s what I compare everything else to. Applying a small amount of this to a blemish will cause it to heal practically overnight for me. I have also had a pimple at work, and applied this to it, dabbed a little concealer over top, and by the time the day is done, so is my pimple. It’s like magic! Drying lotions are kind of a craze in skincare, and I’ve seen them in Mario Badescu’s line, and Kate Somerville’s line. The idea is to have a clay like sediment at the bottom of the bottle, and the clear liquid at the top. Without shaking, you can dip a q-tip into the jar and apply the sediment directly onto your blemish. I’ve had the jars tip over before and it hasn’t been a problem if they get a little mixed up, I just wouldn’t go out of your way to shake the bottle! This is a product you’ll want to apply in the evening rather than during the day, because you’ll be sleeping with the medicated stuff showing on your face. bliss ‘no zit sherlock’ Correcting Serum is another treatment, this one in a squeezy tube, that will help to heal your pimples. The only issue I see with this is that when I squeeze, even gently, I always get too much product out. It’s worth the struggle though because it really shrinks down a pimple quickly, reduces redness, and blends right into my skin’s texture. This or the Clinique product would be number one choices to wear under a full face of makeup. You won’t have to worry about the product pilling up or creating a dry patch! My last spot treatment recommendation is so cool you really have to see it up close. I’ve never seen anything like it. 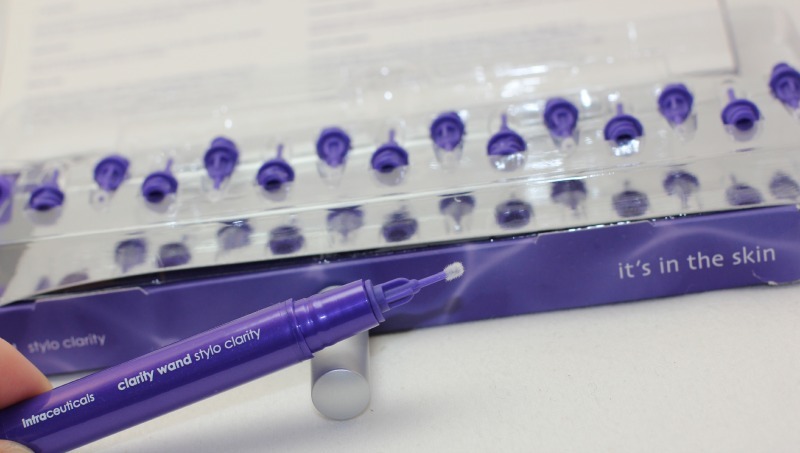 Intraceuticals Clarity Wand Stylo is such a funky and unique product and makes treating acne almost fun. It comes with several tips and the idea is that you would never have to put a dirty tip on the stylo and then to your face. The stylo comes with applicators, and they’re also available separately as a refill pack if you find yourself needing more. These would really be well suited for people who have pretty bad acne and don’t want to touch a dirty applicator to their face, and don’t want to use their finger either, which can be germy. I think this is such a cool concept and it does work really well for me. The last step of my skin care routine would be using a moisturizer. I don’t typically use moisturizers aimed at helping acne. The reason for this is that many are targeted for people with super oily skin, and that’s not my skin type. I am normal to dry and my skin is usually in need of moisture big time. When my skin is breaking out, I am often a teensy bit combination, but still have dry patches most of the time so I have to keep every part of my skin happy at once- the dry parts and the acne ridden parts. My absolute favorite moisturizer of all time and especially for when my skin is acting up is Kate Somerville Oil Free Moisturizer. What I love about this is that I can push down the top of the applicator, and only enough for one use will come out at once. Don’t let the name of this one fool you. Despite being oil free, it is actually very moisturizing. It’s formulated for oily skin but I find that it’s the perfect solution for me when I am breaking out or when I’m a little more combination. This is so nice. I wish I could give everyone a sample of this because I love it so much I know that everyone else would love it too if they got a chance to try it! A less expensive but still very nice option is Clinique Dramatically Different Moisturizing Gel. This wicks away oil but still leaves my skin feeling well balanced and not stripped. It’s not really mattifying, rather I feel like it keeps everything in check. Oilier parts get dried out a little bit and dryer parts get a little more moisture. This comes with a pump top and a pump bottle of this seemingly lasts forever. This is what I most commonly use when I am breaking out. It is also a great summer moisturizer in general if you are looking for one and the one I normally turn to! Never skip eye cream. Don’t do that whether you’re breaking out or not! But I find that the dullness, dryness, patchiness, or oiliness of my skin is accentuated when the skin under my eyes looks weathered. Moisturize this area well and everything else will look better off for it, just trust me on this one! Go easy on the face makeup. When I am breaking out I try to get my skin to breathe as much as possible. I wear makeup, but only if I’m going out somewhere. I really try to give my skin a breather so it can wear the great skincare I’ve applied and try to heal, rather than being masked by a layer of foundation. Don’t over exfoliate. This is an easy one to mess up on because if you’re anything like me, when you’re breaking out, you just want to scrub! Don’t do it. It will make everything worse! I would love to hear what you do for your skin when you are breaking out. Please tell me all of your secrets in the comments!